View of the renewed Israel Museum, looking up Carter Promenade from the new entry pavilions, with Anish Kapoor�s Turning the World Upside Down, Jerusalem 2010, visible in the distance. 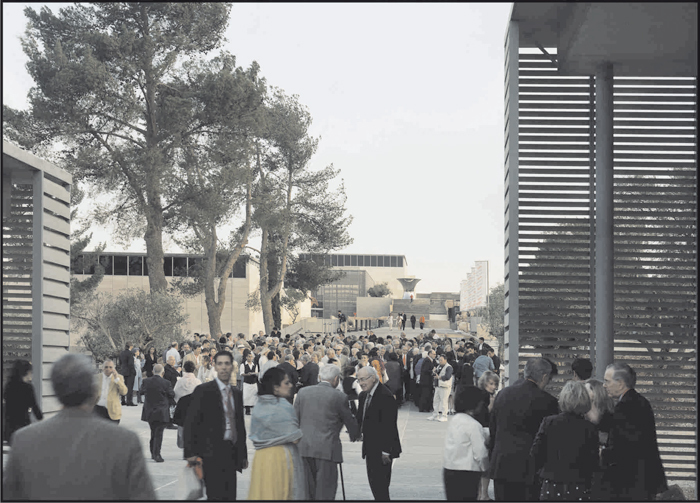 Jerusalem, January 19, 2011 � The Israel Museum, Jerusalem, has welcomed more than half a million visitors since it inaugurated its renewed campus on July 26, 2010. In just under six months, the renewed Museum has welcomed unprecedented numbers, including first-time visitors from across the country and tourists from around the world, through an engaging program of exhibitions, guided tours, public events, and educational activities. "Thanks to the beauty of our renewed campus and the strength of our program of exhibitions and special events, Museum attendance has reached well beyond our expectations. The response from both first-time visitors and long-standing friends has been overwhelmingly positive, and we are grateful to the public for this notable display of interest and support," said James S. Snyder, Director of the Israel Museum. 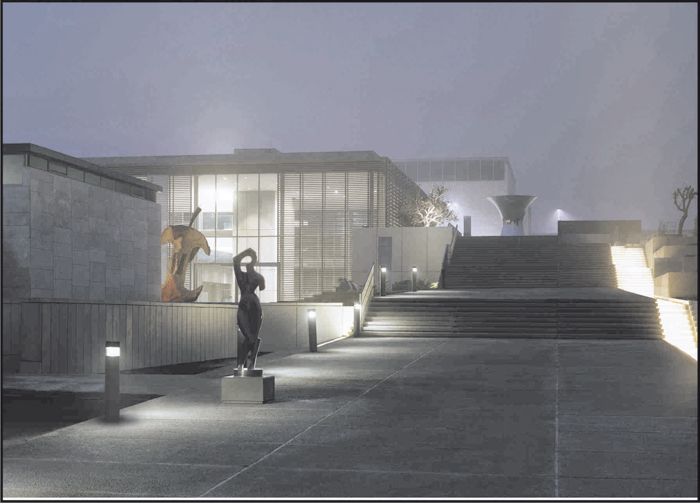 Nighttime view of the Israel Museum�s new Gallery Entrance Pavilion from Carter Promenade, including Claes Oldenburg and Coosje van Bruggen�s Apple Core and Anish Kappor�s Turning the World Upside Down, Jerusalem. Current attendance statistics more than double those counted during the three-year expansion and renewal project when the average number of visitors annually was 500,000 � the highest number recorded since the year 2000. Total attendance for 2010 was 718,000. The Museum's current attendance rate projects an annual attendance of one million visitors, which would be the highest number recorded in the Museum�s history. In 2010, the updated Museum website also received 33,915,950 'visits' from users in 134 different countries, compared to 26,929,400 in 2009. In the last six months, Museum membership has also grown to include 12,000 new individual members, and 1,600 student members, more than tripling Museum membership before the campus project began. 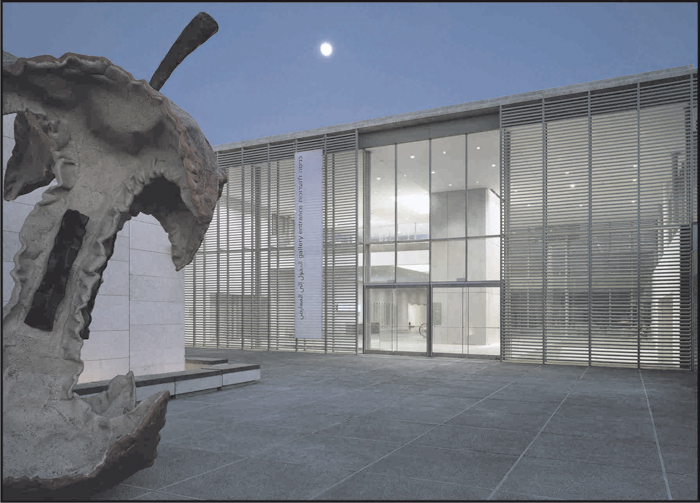 Nighttime view of the Israel Museum�s new Gallery Entrance Pavilion from the north with Claes Oldenburg and Coosje van Bruggen�s Apple Core, 1992 in the foreground. Since completing the comprehensive renewal of its 20-acre campus, with new galleries, service facilities, and public spaces, the Museum has been able to expand its public offerings to serve a broader and more diverse audience. Visitors are drawn to newly displayed collections in its Archaeology, Fine Arts, and Jewish Art and Life Wings, and to temporary exhibitions such as Still/Moving and Artists' Choices, highlighting both new acquisitions and long-held masterpieces from the Museum collections. Two new site-specific installations � Olafur Eliasson�s Whenever the Rainbow Appears (2010) and Anish Kapoor�s Turning The World Upside Down, Jerusalem (2010), are also proving to be notably popular, and a full program of public events including guided tours, family activities, concerts, films and late-openings is attracting impressive audiences.